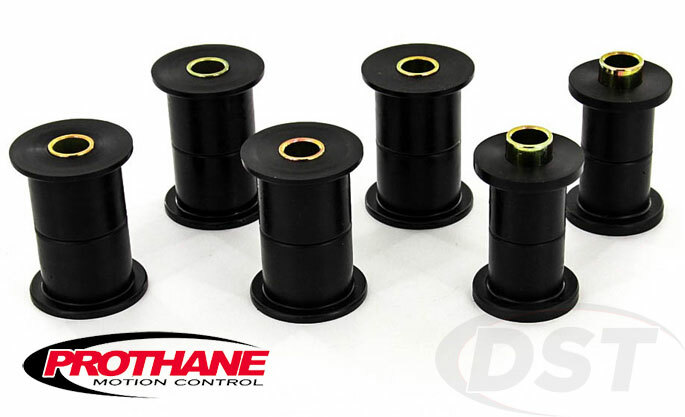 Prothane's Polyurethane Front Leaf Spring Bushings provide long-lasting axle alignment and reduce steering wander caused by worn original rubber bushings. Check out the Leaf Spring Bushing kits for your vehicle below. Polyurethane leaf spring bushings from Prothane are much more durable than rubber and will hold their shape through the wear and tear of everyday or extreme driving. The front leaf springs help to locate the front axle and since your steering depends on how straight that axle is the bushings holding those springs in place are pretty important. When the original bushings wear out you can experience steering wander or bump steer since the misshapen bushing leaves room for the spring to shift. Polyurethane leaf spring bushings from Prothane are much more durable than rubber and will hold their shape through the wear and tear of everyday or extreme driving. Since poly doesn't flex like rubber your leaf springs will hold their position and keep your axle and wheels pointing in the right direction. Polyurethane bushings also hold up better against the elements that degrade rubber, like road salts, grime, and engine fluids. Made in the USA and covered by a Lifetime Warranty, it's hard to go wrong with Prothane's leaf spring bushings.